Do you need extra help for EL students? Try the Main ideas and DetailsPre-lesson. 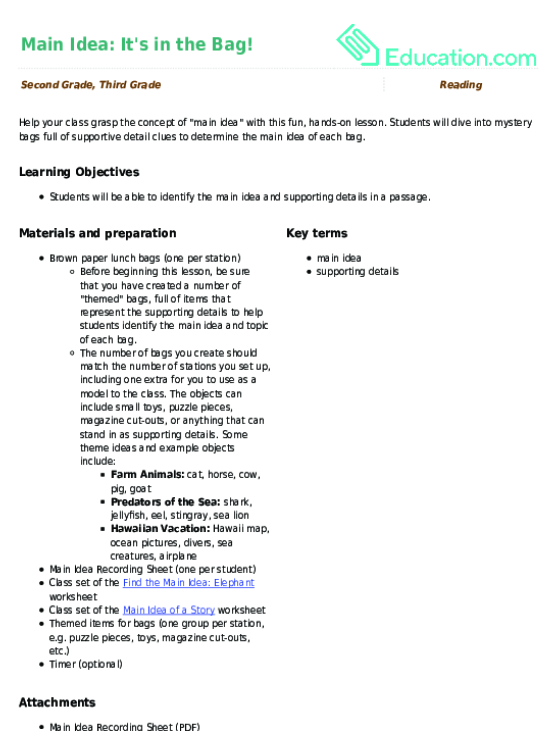 Students will be able to identify main ideas and supporting details. Tell students that the Main ideaIs the most important or central idea in a paragraph. Just like there is a main street in a town, there is a main idea in a written passage. Show students a box. Place various cooking supplies in the box. Pull out one object from the box at a time. At the end, ask what these items all have in common. Make the connection that the theme of this box is also its main idea. Beginning:Give students the name of all the objects. Allow ELs to act out how they would use the tools to show they're understanding. Intermediate:Encourage them to provide an example of how all the objects are used together. Provide a word box of the tools. Have ELs tell a partner the definition of main ideas and supporting details, either in English or their home language (L1). If needed, provide the sentence stem "The main idea is ___." Model with a familiar or culturally relevant topic. Tell students that just like the box had a main idea, a paragraph or story also has a main idea. 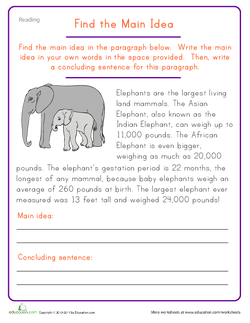 Read the paragraph on the Find the Main Idea: Elephant worksheet. Explain that often the main idea or what the paragraph is mainly about is stated in the first or last sentence. Reread both of these sentences and note their similarities. The main idea is, “Elephants are the largest living land mammals.” Write this in your graphic organizer. Tell students that to find the Supporting details, they need need to look for ideas that tell a little more about the main idea. Every detail must match the main idea. Go through and model picking out the supporting details. Write these details in the graphic organizer. Think aloud about how each detail must support the main idea. Beginning:Provide a simple definition in their home language (L1) or new language (L2) for the following words: pounds, mammal, gestation, longest, place value terms (e.g. hundred, thousands, and millions). Provide cognates of the key terms if there are any in their home language. 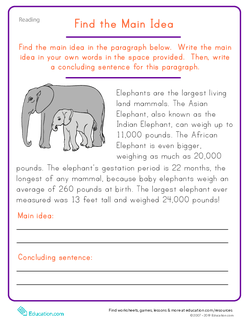 Allow ELs to verbally summarize the Find the Main Idea: Elephants worksheet. Distribute a copy of the text and allow them to work with a partner as they copy your teacher markings on their papers. Pair ELs with sympathetic non-EL and have them alternate reading a paragraph each. 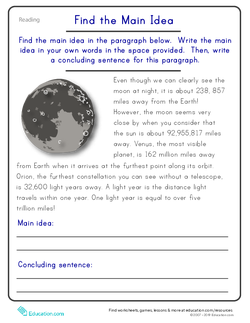 Give students a copy of the Find the Main Idea: The Moon worksheet. Have students draw the same organizer that you used on your chart paper on the back of the worksheet. Have students work in pairs to discuss the main idea and supporting details that support the main idea. Instruct them to put the information into the chart. Beginning:Pair beginning ELs with sympathetic partners and have their partner read the text aloud. Then, have the beginning EL tell what the text was about. 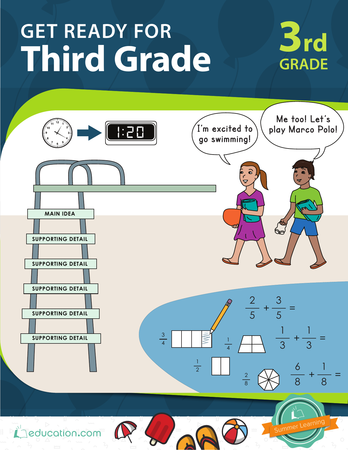 Provide a partially completed chart with phrases ELs can use to complete the chart. Ask them to orally explain their placements to their partners and/or the teacher. Intermediate:Allow them to use an online illustrated dictionary or give them definitions from the Find the Main Idea: The Moon worksheet for the following words: miles, furthest, constellation, telescope, light years. Ask ELs to rephrase the meanings of the key words in partners. Allow them to use their L1 or L2. 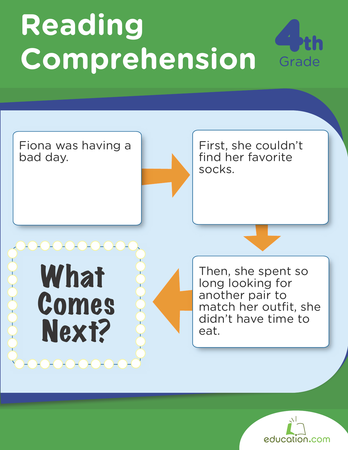 Provide a word bank and/or sentence frames they can use to complete the graphic organizer. Ask ELs to share their sentences aloud before writing them on their graphic organizer. Have students complete the Find the Main Idea: Shark worksheet independently. Beginning:Give them a shortened version of the text that is on grade-level and allow them to read it with a partner. Ask them to summarize their reading before completing the graphic organizer on their own. 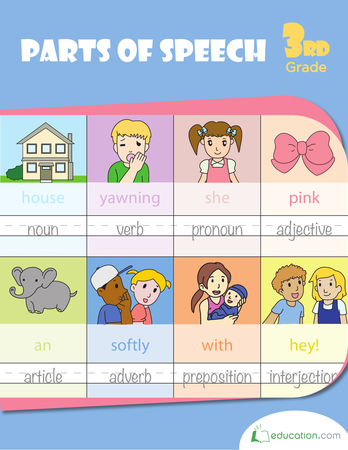 Support their independent practise by providing a partially completed chart with phrases ELs can use to complete the chart. Ask them to orally explain their placements to you. Intermediate:Briefly summarize the text and allow them to read it with a partner and then complete the graphic organizer on their own. Allow students to use sentence frames/stems for oral and written work. Enrichment:Have advanced students select a paragraph from a nonfiction classroom reading book. Have the student identify the main idea and supporting details in a separate graphic organizer. Support:Scaffold student learning by providing the main idea in another example. 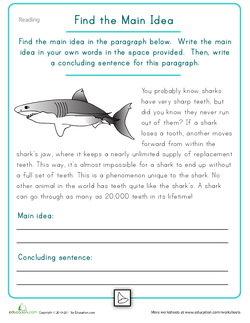 Have the student go through each sentence in the paragraph and answer "yes" or "no" if the sentence is connected to or supports the main idea in some way. 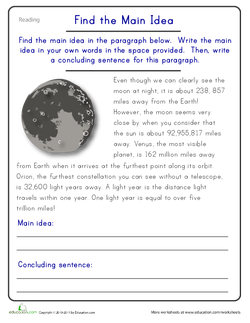 Have the student highlight the topic and conclusion sentences to aid in knowing where to look to find the main idea. Circulate the room as the students work. Invite the class to participate in a discussion. Ask questions like, "What is the main idea? How did you know?" and "How does this detail support the main idea?" Collect students' worksheets once they're done. Review them later to assess students' understanding. Beginning:Focus on the content of ELs response when assessing their understanding of the main ideas and supporting details. Intermediate:Allow them to use a word bank of key terms when they share their ideas. Review with students how finding the main idea was similar to naming the theme of the box in the beginning of the lesson. Ask students to share the strategies they used to differentiate a main idea from a supporting detail. Then, have them share how they determine if the supporting detail supports the main idea. Beginning:Allow them to share their ideas in pairs before sharing aloud. Encourage them to use their vocabulary cards and word webs when they explain their graphic organizer. 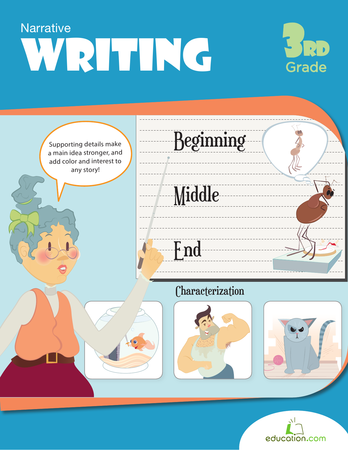 Intermediate:Encourage ELs to use their graphic organizer as reference during their writing and oral delivery. 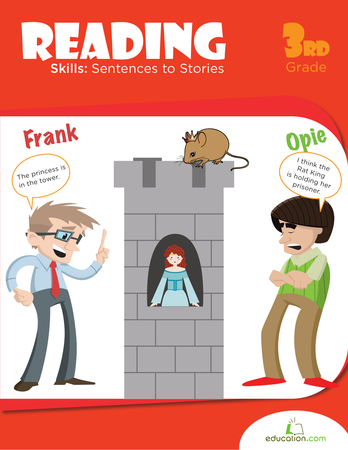 Young learners will love finding the main ideas in short informational texts.